Scheduling jobs and appointments provides the framework for your business. It is a delicate part of your business routine that can make the difference for how smoothly everything operates. Smart Service offers the perfect solution to optimize your business operations and get your technicians to where they need to be. Paper schedules are inefficient and inadequate to suit your busy schedule. Smart Service integrates with QuickBooks and allows you direct access to all your customer information, so your schedules will be informative and complete! You’ve spent years keeping records of your customers on QuickBooks. All that data would be a pain to enter into a new software, but with Smart Service scheduling software for garage door businesses you don’t need to! You can start using Smart Service with all the information you already have. Type a customer’s name into the Smart Service scheduling software for garage door companies and their details will automatically populate! All the information you need is available with a swift click, making your garage door business run more smoothly. QuickBooks and Smart Service scheduling software go hand-in-hand because we know you don’t want to waste time double-entering data. Information you enter into QuickBooks gets loaded onto Smart Service—and vice-versa! When you create a job, it gets filled with information from QuickBooks like customer location, previous notes, and equipment/operation costs. When you are done with the job, Smart Service creates an automatic invoice that is ready-to-bill on QuickBooks. How neat is that? Your business operates on-the-go and so should your software! The Smart Service mobile app gives your technicians the tools they need to stay prepared in the field. Smart Service saves your business money by saving you time, eliminating paper costs, and keeping track of your assets! Tired of losing forms, trying to read bad handwriting, and getting stains on important paperwork? Throw out (or recycle) your paper forms—they’re old news now! Keep track of your technicians and get a real-time update of whether they’re on their way or on the job. 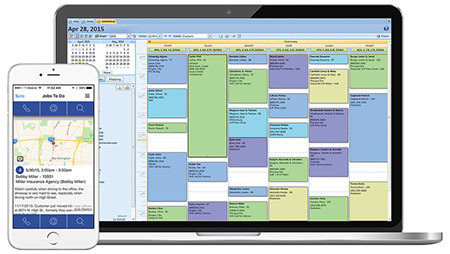 Dispatching through your scheduler is the solution you need. Smart Service is the best multi-purpose tool for your business. You know it rocks at scheduling, but did you know it can do this as well? Mobilize your garage door business with Smart Service! Check out some more garage door dealer tips and tricks!